This weekend I finally got started on a project that I was intending to do almost a year ago! Do you have some of those? I have actually have quite a few of those so it feels good to have one checked off of the list. Recently Preston got the urge to rearrange his bedroom and I decided that it was time to finish up a few things we had started awhile back. Being that he is such a content and happy kid, his room has been a bit neglected and put on the back burner for too long now. He probably would have been fine just leaving well enough alone even now, but I think he deserves a space that is bumped up a notch. 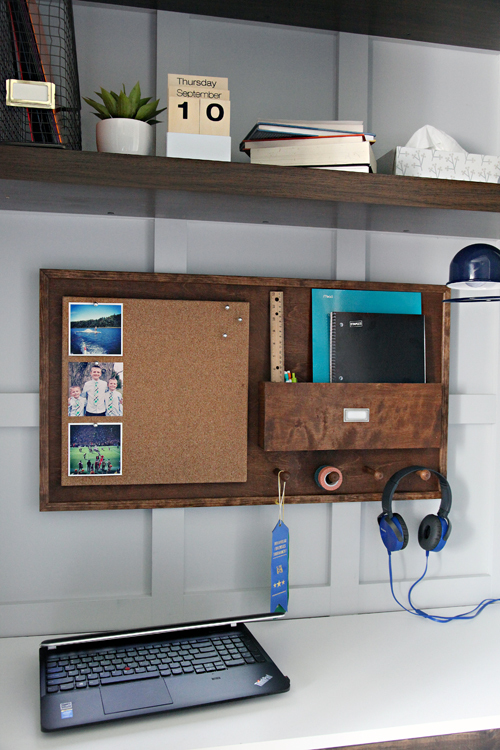 We started last week with a nice little study organizer DIY, which cleared off his desk to provide ample space for homework. This week we focused on his clothing closet. Back in 2010, we gave Preston a closet office as an exciting and special place for him to work on his homework, read and play on the computer. Over the years if he would go missing, we would find him there. It was "his" special place and we could tell that although giving up a closet isn't a normal or ideal setup for most, it was the right one for him. 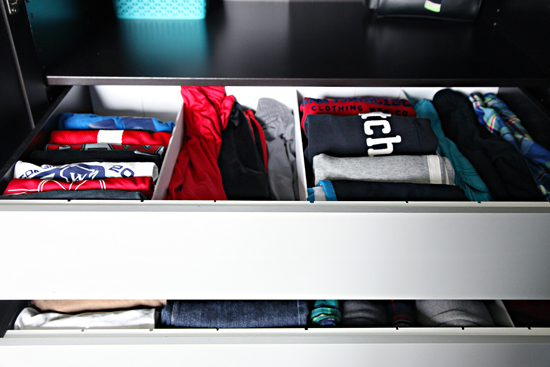 After we took away his traditional closet to be used as an office, he stored his clothing in a hand-me-down dresser for a few years, but eventually outgrew it. We added it to our master bedroom and it now stores all of our bedding and lower level linens. That left Preston in need of a new clothing storage solution. We asked him if he wanted to give up his closet desk area and he looked at us like we were aliens from a land far, far away. So we decided to purchase him an armoire from IKEA and let him keep his happy place. At the time, the armoire we selected was only available in white or black-brown. I didn't think white was the way to go in a teen boy room, so we went with the darker option. Only problem was that once it was placed and setup in his room, it turned into a big dark hole. 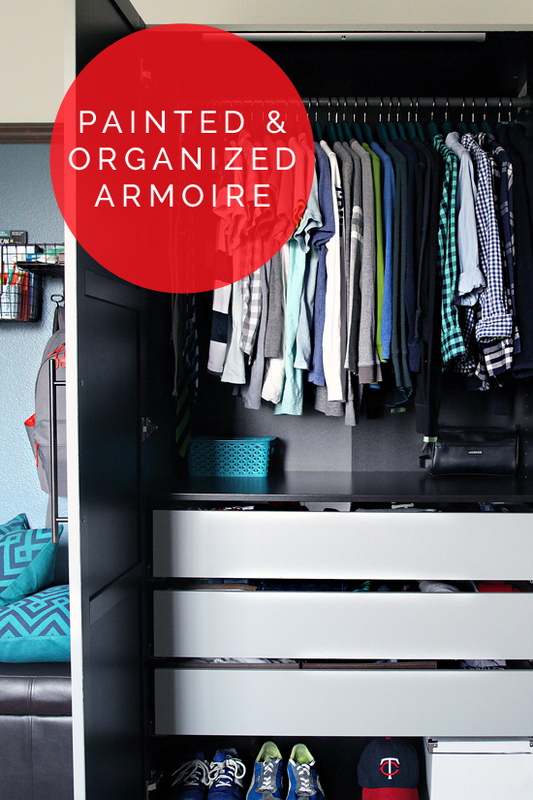 It fit in his room fine, and most of the time I prefer the organizational options of an armoire over a traditional closet space. However, it was heavy to the eye and during most times of the day, the darkness made it challenging to see the contents of the closet. So we decided to move it and paint it. I asked Preston his favorite color and when he said dark turquoise, I was a little surprised (and secretly excited). 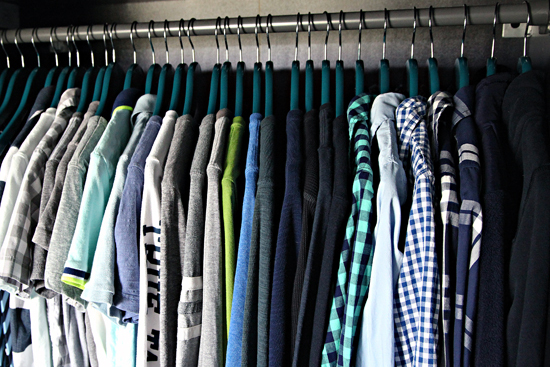 And then I looked at his wardrobe and noticed we were already on the right color track with his bedroom; greens, blues, grays and turquoise. Perfect! But he already had orange stripe curtains which he also said he really liked, and he opted to keep them as well. So, I am planning on sticking with the same colors we have been using for the past few years, and injecting small hints of the turquoise as we move forward. I have painted a few pieces of IKEA furniture in the past with very few issues, so I wasn't too nervous for this project going in. However, I didn't want to risk painting the entire interior of the closet, just in case I wasn't getting good coverage and because of the wear and traffic it would be receiving right away. 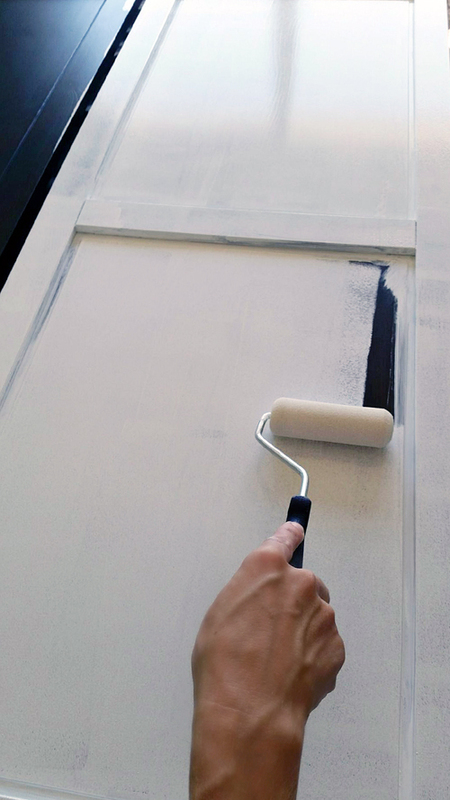 For these types of projects I typically use an oil-based Zinsser primer, and I love it. 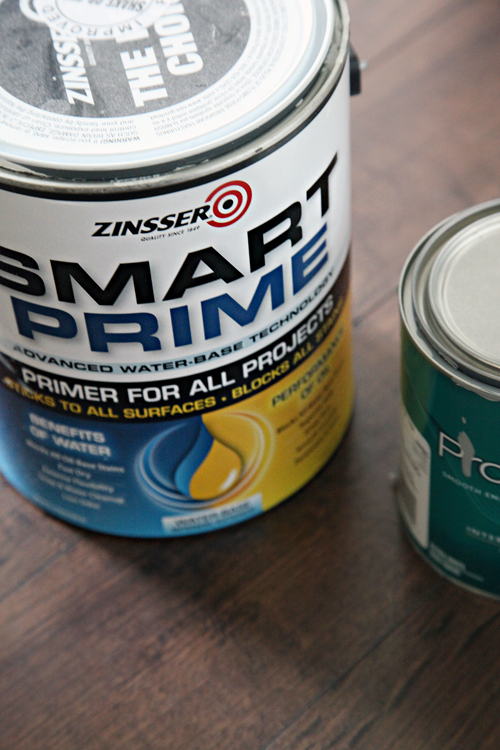 But for this project I grabbed our water-based Zinsser Smart Prime because I liked how it worked on our built-in fireplace and also appreciate that it is low odor when painting indoors. 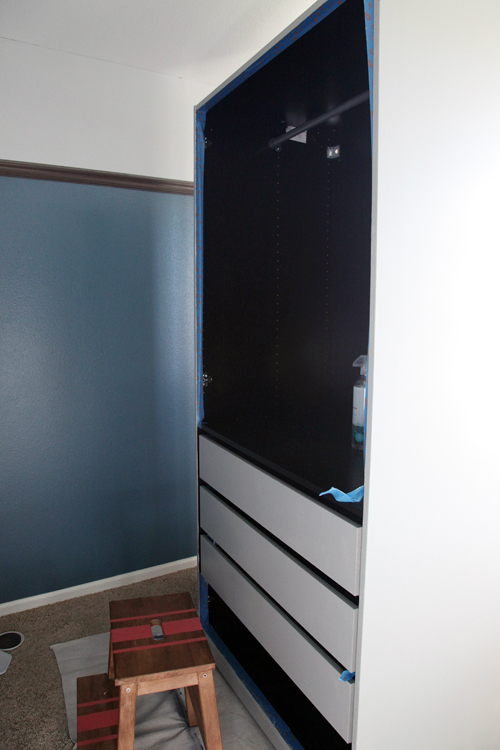 I taped and cleaned both the armoire and the doors, and used a smooth foam roller to apply the primer. 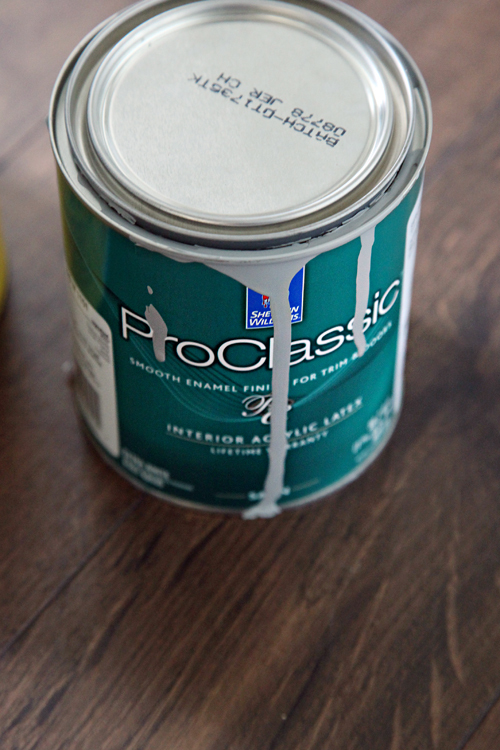 After the primer was dry and cured per the can recommendation, I went to my "go to" furniture paint which is Sherwin Williams ProClassic enamel. This stuff has held up beautifully on our painted hutch and our IKEA shoe cabinet. The color we selected was Gray Matters. This time I cut in on the armoire and door panels and Preston rolled, it was nice to work on this project together. 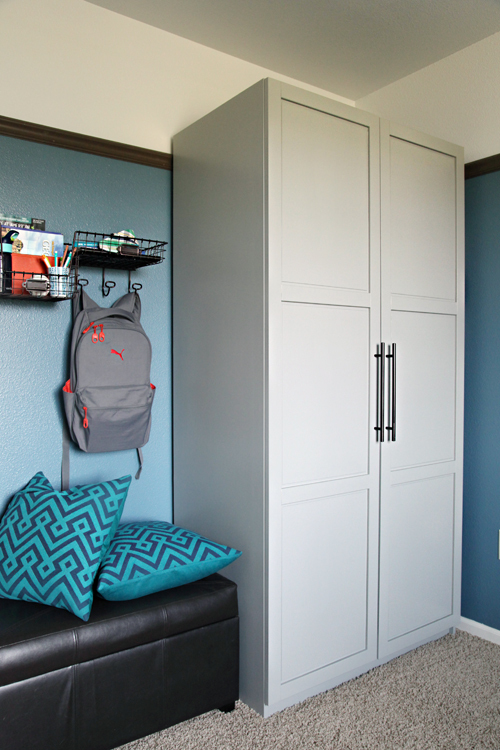 When we finished, I noticed that although we had held a swatch up to both the blue and gray areas of his bedroom, the new gray was blending quite a bit with the upper wall gray. 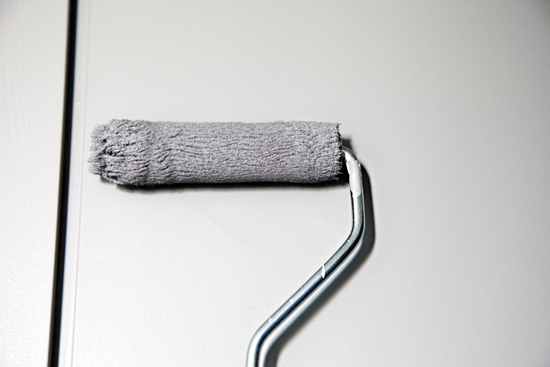 I went to the top of the Gray Matters swatch and picked up a gallon of Nebulous White, and painted both the upper portion of the bedroom wall as well as the entire ceiling. That wasn't planned and set me back a day, but it was definitely the right thing to try. Something is still a little lack-luster, and we may do a fun pattern on the upper or lower portion of the wall, but I haven't completely decided on anything yet. We relocated the armoire to the opposite side of his room, and now the light from the window actually helps to light the interior of the closet. We also added a motion sensor light which now turns on automatically each time the doors are open. He thought that was the coolest part of this whole project. (I also thought this was a fun feature but I unplugged the light for the remainder of the photos because it was washing out my images). 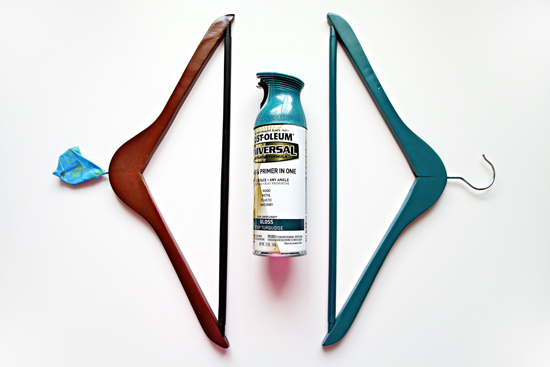 To bring in the turquoise color, I thought it would be fun to paint his hangers. I love painted wooden hangers, we did the same in our laundry room and they have held up great (and the paint has never come off on our clothing). 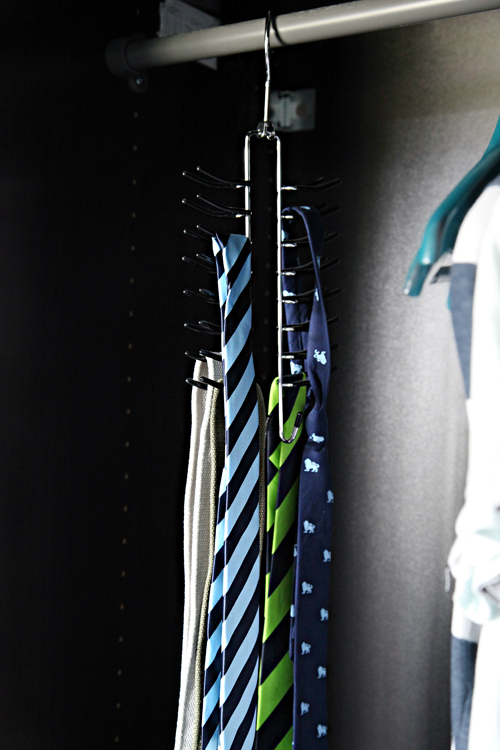 It is a great way to update the hangers from ones that my husband would use, to ones that are fresh for a young teen. When we purchased the armoire, we added three drawers to the combination. These drawers are super-sized and also have that brilliant soft closing feature we all love about IKEA. For this project, I wanted to add some drawer dividers to allow Preston to "file" his clothing and easily find specific types of items. I was having a hard time coming up with something that would span the 22" distance of the drawer from front to back (especially something that didn't cost a fortune), so we made some ourselves. We picked up two 6' pine boards from Home Depot and cut them each to the width of the drawers (for a total of 4, 29" pieces). We measured and marked the boards to prepare them for grooves which would allow us to adjust our divider sizes. 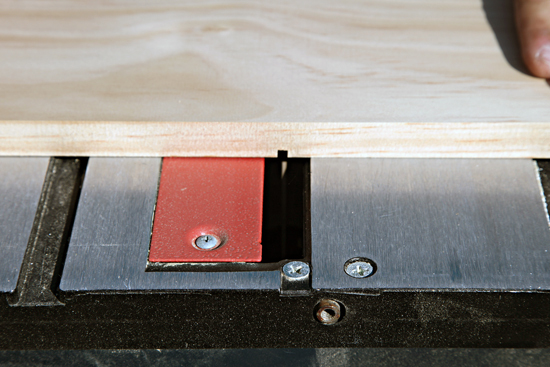 Bryan ran the boards over his table saw, leaving a few inches between each groove he created. The grooves along each board allowed us to insert thin wooden pieces as dividers (craft/hobby wood found at Home Depot). I asked him to space the grooves a few inches apart to allow us to customize and change the configuration in the future. Quick Tip: It is OK to cut the grooves a bit wider and deeper than necessary to accommodate your wooden slats, especially if you plan to paint them. Above was our first round of cuts, but we ended up making each groove a bit wider and deeper for an easy fit. Each grooved board was added to the front and back side of the drawer. Then I inserted the thinner slats to accommodate specific clothing types. 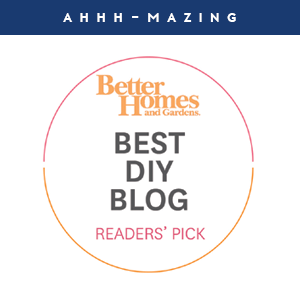 We could have used one more board (which we will pick up during a future Home Depot visit), but this couldn't have worked out more perfect in the end! The top row has his athletic and dry fit T-Shirts in the first slot, athletic shorts in the second slot (which I just laid out loosely), active pants in the third and swim trunks in the fourth. 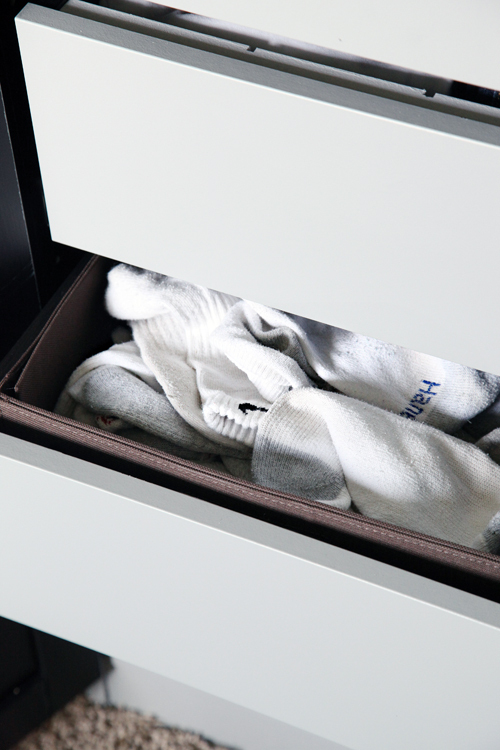 The next drawer holds his shorts and dress pants in the first slot, his jeans in the next, pajamas in the third and specialty sport socks in the last. The filing method is so fabulous and easy to work with, he will have no problem keeping up this system. And the dividers are a dream. 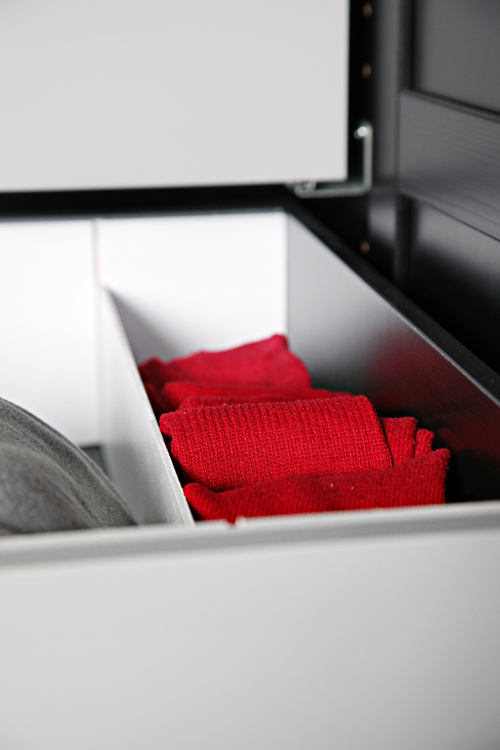 The next drawer holds a few canvas bins of everyday socks, underwear and his baseball uniform. And I definitely pick my battles when it comes to organizing kid's socks. And that completes the painted IKEA armoire tour! With the movement of the armoire, I also added a wire wall organizer and bench nearby. We screwed the organizer into a stud so it was nice and secure and can hold a heavy backpack each night. 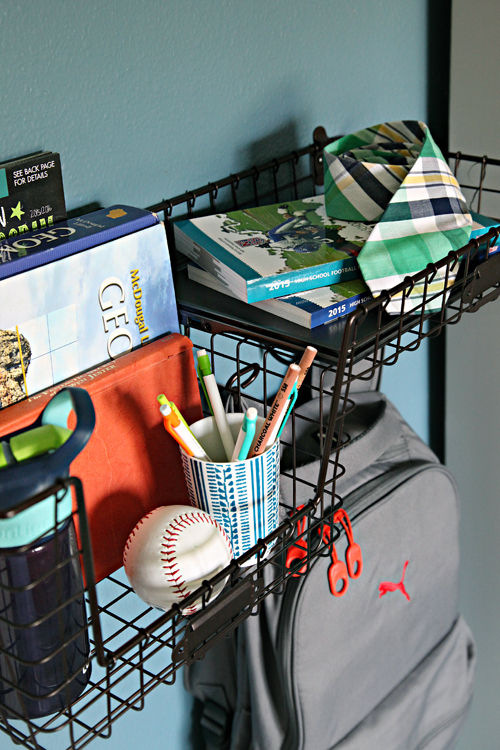 The added baskets are a great drop zone for all of the random items teen boys seem to have on them/with them all of the time. Just below the basket is a storage bench, which we have had for years. Although not the prettiest or trendiest piece of furniture, it functions great as added seating when friends visit or "hang out" and as a place to toss pillows from his bed at night. And because he hosts a lot of sleepovers, we stocked the bench with an air mattress, bedding and a toiletry kit for his guests. 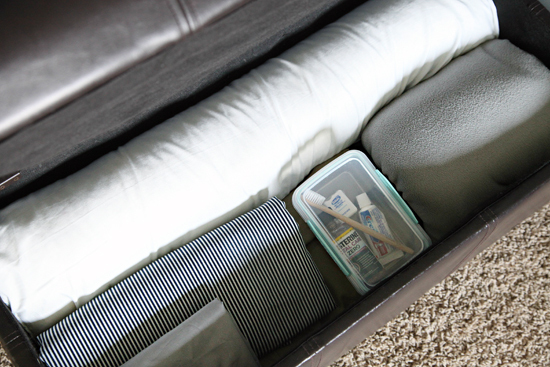 Quick Tip: Create a toiletry kit for sleepovers with the small items you receive at your dental visits (and be sure to swap out the toothbrush after each use). Update! I did want to mention that even after a couple of days of being painted, the drawers of the armoire seem to chip pretty easily which is a bit disappointing (and I don't remember that happening with the shoe cabinet or the hutch). I believe it may be the water-based primer (vs. the oil based I usually use), but I will be sure to update if things cure up for the better in the next few weeks. 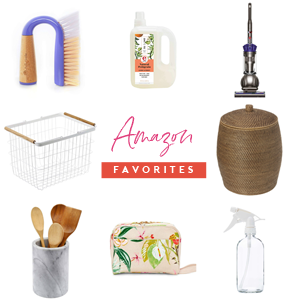 I love the office closet, I love the painted hangers, and I love the target bin for deodorant! I hope P1 is in charge of folding his own clothes for the drawers - when he goes to college he's going to be glad he knows how to keep his stuff organized. It looks great, but sorry to hear about the chipping paint problems. I would add a mirror to the inside right door of the armoire! Great suggestion! He does have another mirror for his room, but I could add one to the upper inside portion of the door (the doors flush up against the drawers so it could only be a partial length mirror). Thank you! Wow, looks great! I love the pops of turquoise! Hi Jen...love this too...Preston is one lucky boy! 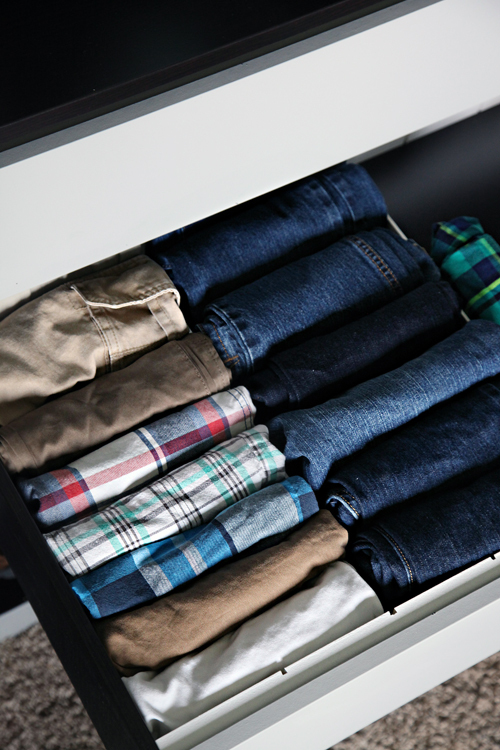 Compartmentalising those wide drawers is a wonderful idea. 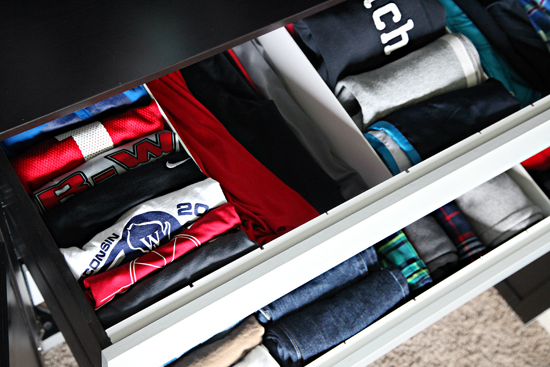 I too have done this with my wider than normal drawers and it makes organising a 'breeze'. Love the colour scheme . . . It's so calming. Task well done. I'm sure he loves it absolutely. Great choice of color for an armoire. Now, it doesn't look like a black hole anymore. :) Love the drawer dividers too. Brilliant idea! Congrats on your new home Gena! Aww, I love it! Very sophisticated but still appropriate for a teen boy. Great job! I absolutely love and admire the effort you go to to create organized storage. 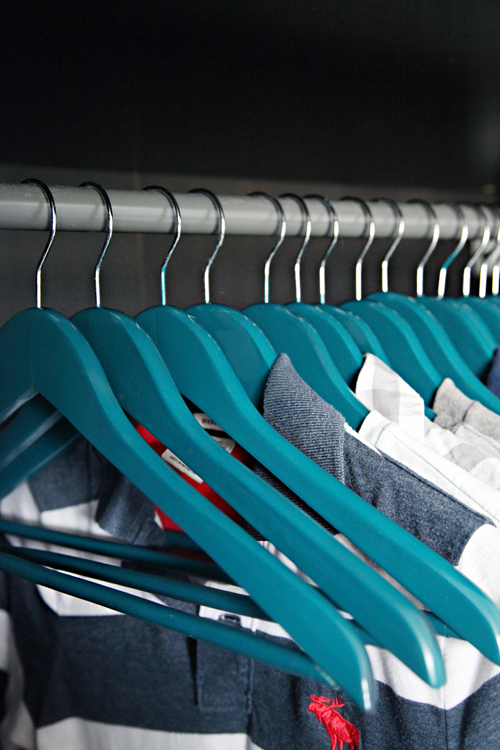 I have yet to commit to making dividers and sectioning off areas of closets more efficiently, but can completely see the advantages of doing so and mentally mark it on my list of things to do every time I see one of your closets! I love this project! Amazing! I was a teen 5, 10, some years ago who's counting. With classes sports and clubs a mom as organized as you would have helped so much. Love this! The armoire looks like it would be a great addition to any bedroom with the space. Customizing it like you did leaves endless possibilities. Those drawer dividers are amazing! I need those in all of my drawers. I LOVE all the customizing that you did to this space! 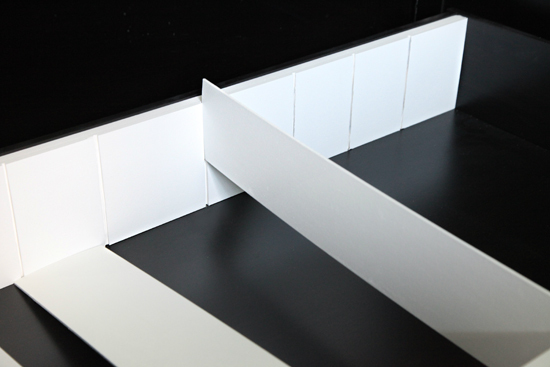 The dividers…gasp! I want them. I may have missed this...but where did you get the organizer he hangs his backpack on? I love the pax wardrobe from Ikea. It's amazing how much you can fit inside of it how neat and organized everything is. My husband had one in our old house and we loved it. In our new house we have so many closets so we sold the pax and our new bigger closets are a complete mess. I really miss that good ole pax. I love the inside out makeover you did on your sons wardrobe, excellent. 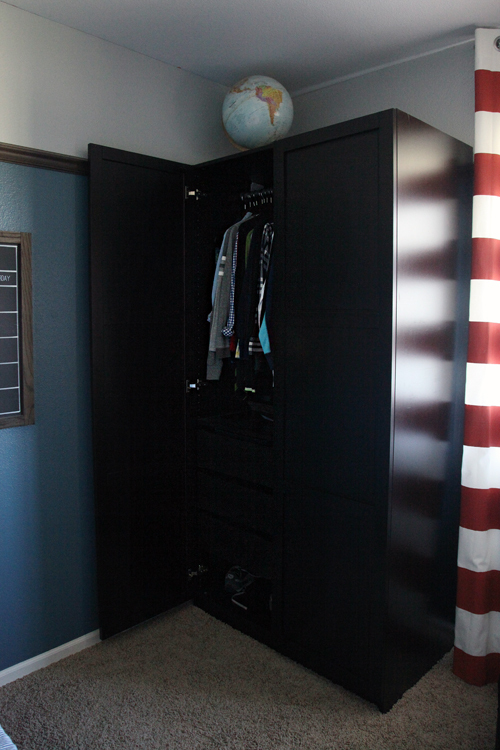 This is a fantastic idea, my sons room has a tiny corner closet and could really use the extra space. Can you tell me which Armoire this is from Ikea, it looks like the perfect size? It is the PAX frame paired with their Komploment drawers. They come in a variety of widths and depths to accommodate a variety of needs. xoxo! 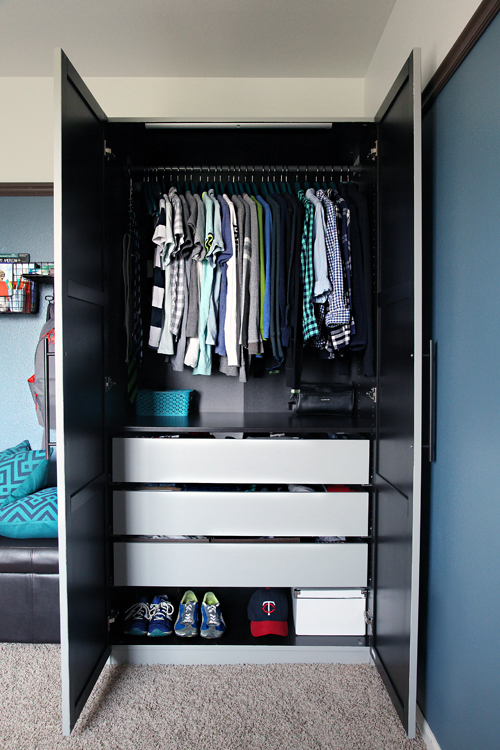 This is a great way to customize an IKEA piece for a teen. 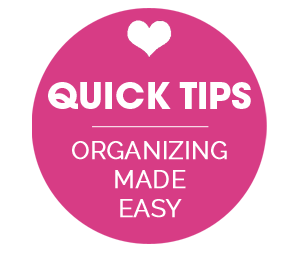 I especially love and will use the adjustable drawer organizer method. 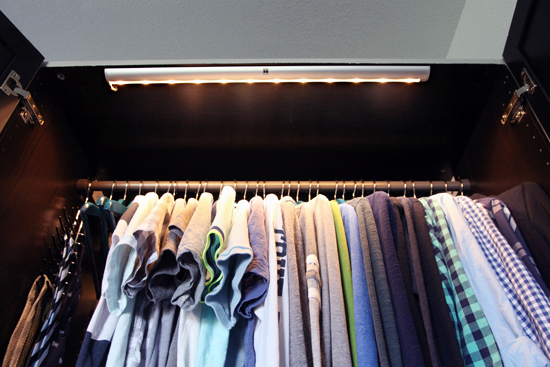 It's so important to set up systems for teens that they feel are their own and reflect their sense of style. Nice job! Hi Jen: WOW! 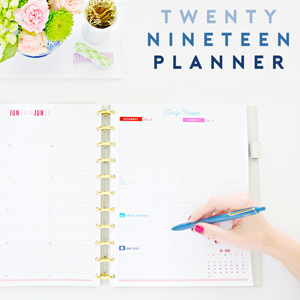 This is fabulous, especially the drawer dividers, and the turquoise hangers! I would not have thought to spray paint wood hangers! I would love to have something similar in my house! Question - is your son a tidy person? This is a great update! My son is in need of an update and I love watching the progress and process. We file my sons clothes too, and it makes such a difference so that he wears more than just the same 3 shirts. 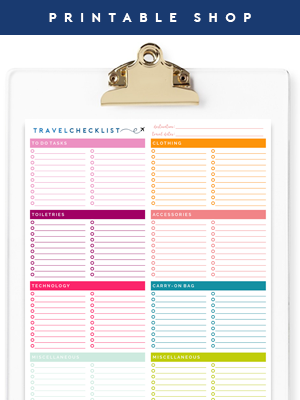 We haven't done dividers, but I really can see how beneficial that is. I think we will implement that next for him. 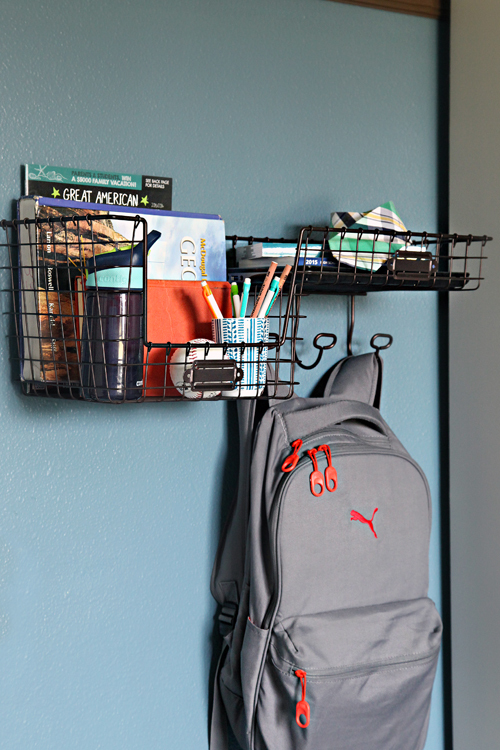 And I have been looking for ages for a wire wall organizer just like that one. Thanks for linking that! Painted hangers...genius!!!! I love the armoire in grey. So chic. I never think to paint IKEA furniture, but I'm so glad you suggested it. I'm buying a home and I know there's going to be a lot coming from IKEA. Love the update to the wardrobe! Definitely would avoid using water based primer and enamels, they tend to chip and peel quite easily unless the area is never touched and is prepared very well for eg. New timber or freshly sanded surfaces. Sadly made the same mistake when I had all the trim in my house repainted with water based enamel. 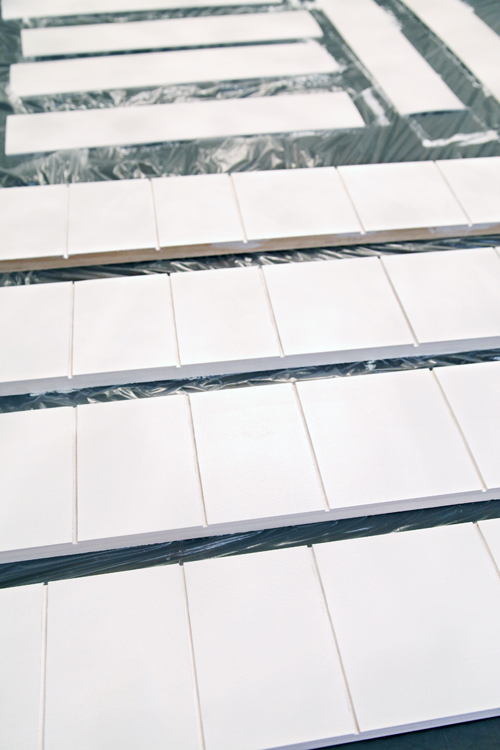 I supplied the paint and thought "less fumes, faster drying, cheaper" means just as good as oil based. Nope. The painter did warn me that it wasn't the best after I gave it to him but I went ahead with it anyway. All it needs is an accidental knock or scuff with shoes and the paint chips and peels right off. Oil based is worth the extra effort and money. That looks great! I hope my kids can be that organized when they're older (currently almost 2 and almost 4). I am also painting an ikea piece. The Bjursta sideboard. It used to be the brown laminate colour, and I'm trying to paint it white with a black top. 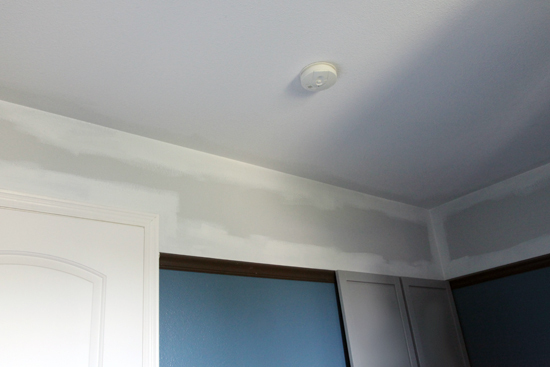 I used a water based primer as well, but I'm noticing something keeps bleeding through the paint (I'm currently on my third coat of Behr ultra which is the paint and primer in one...on top of the B.I.N. Primer). I also noticed that the paint still feels tacky and peels if there is the slightest scratch, right back down to the brown laminate! I'm at my wits end with this piece already! So, after all that, I'm looking for some advice. Should I somehow take the paint off and start over with an oil based primer? Or, can I keep painting with the current paint and apply a few coats of Polycrylic when I'm done? It is going to be a TV stand and house dvds and game systems, so it will get a lot of use. I am so sorry to hear that Nicole, I can imagine how discouraging and frustrating that would be. You could try to strip back the paint and go with an oil based primer and the nicer furniture enamel from Sherwin. That was an amazing combo for our shoe cabinet and with all of the traffic it sees each day it has held really great. And I thinking waiting the proper time in between coats and after is very important as well. Best of luck, I really hope you are able to get it worked out. Hi, how many coats of primer did you use? How many coats of paint did you use. I just painted a dark IKEA expedit to white and it took me 2 coats of primer and 4 coats of paint! Hi-Did you use satin or semi-gloss? I love this post and project! 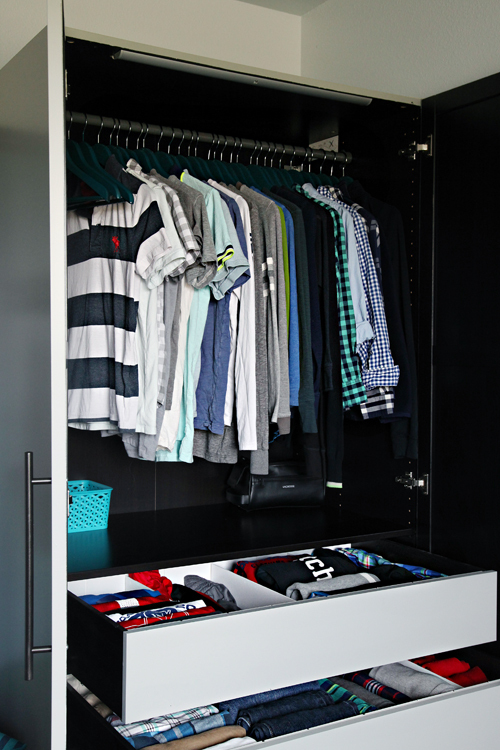 I'm inspired to reorganize my boys' shared closet this weekend. 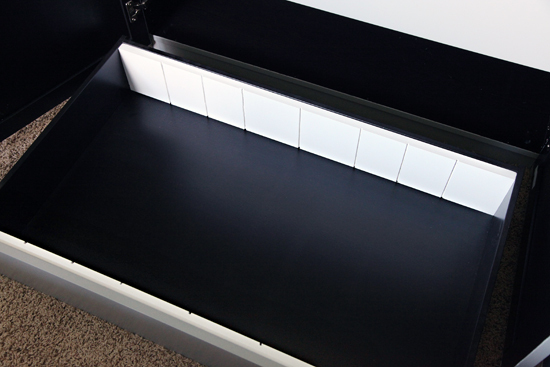 The way you created those drawer dividers is fabulous. hi, I was browsing through some of your posts, and was wondering, where do you get your contact paper and washi tape? Contact paper can be found on Amazon or at HomeGoods, TJ Maxx & Marshalls. Home Depot also recently started selling a few fun prints. I love the gray it suits and the white was definitely the right choice. The little "drop off station" is great as well. I really love this thing and I also have a few questions. First, did the handles come with the wardrobe? Second, is the wardrobe and komploment drawers you bought still on ikea? I've looked but I didn't find anything like it and I didn't know if it was just somewhere and I just couldn't find it. I like the paint color on the wall. Do you know what color it is? Thank you! The color is Behr's Cayman Bay PPU14-3.